Qualcomm’s Snapdragon Tech Summit is in full swing on Hawaii, and we get early access to some interesting and potentially disruptive devices coming to the market. 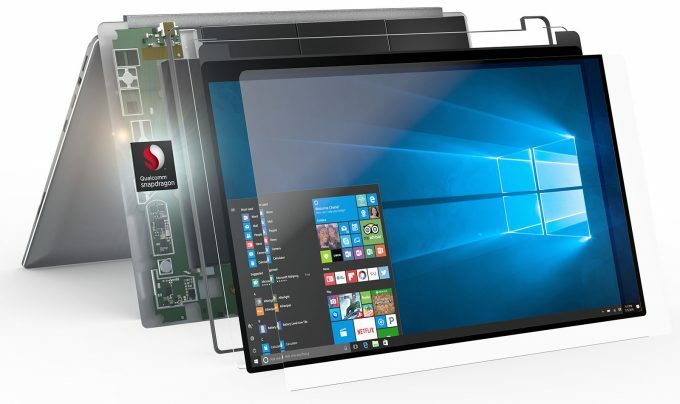 While 5G gigabit LTE Internet will have quite a few people salivating, it’s the Windows 10 notebooks powered by Snapdragon 835 SoCs that have our attention. We took a look at some prototypes from ASUS and HP and see what the future holds for Microsoft. The mobile markets are about to get a whole lot more competitive over the next couple years, and the ubiquity of the smartphone may start to give way to a new generation of notebooks too. Qualcomm, the designer of the most successful mobile microprocessor brand, Snapdragon, will be pushing two new waves of technology; 5G gigabit LTE, and butting heads against Intel by providing Snapdragon processors for Windows 10 notebooks. Wireless interconnect technologies have come in two major flavors, WiFi as supplied for local networks in buildings and venues, and carrier-based mobile phone standards, like 3G, 4G LTE, and soon, 5G LTE, the first gigabit carrier standard to cover towns and cities. Qualcomm is already helping carriers, like Sprint, to setup 5G networks, and supplying the chips to mobile device integrators like Samsung and Xiaomi. Qualcomm’s vision for 5G, is to provide it like power, to make it so ubiquitous that devices and applications assume it’s there, all the time. The speed aspect of it is critical as well, as gigabit speeds have been a part of modern computers, especially desktops, for over a decade now, and many network based technologies are built around those kinds of speeds. Gigabit networks are what allowed near real-speed transfers from hard drives and storage devices. In the case of smartphones, that kind of throughput is much the same as the memory bandwidth available to the CPU. In effect, 5G will become a major integrated part of a device moving forward, especially with cloud storage now becoming so prevalent. We’re not going to see widespread engagement of 5G until the first half of 2019, since it will take time to build the towers and allocate bandwidth through various carriers, as well as implement the 5G enabled modems into smartphones. However, this is normal progression of technologies, the real impact won’t be seen until 3 or 4 years after that. So what is Qualcomm doing now that’s so disruptive? How about Windows 10 machines powered by Snapdragon 835 processors? 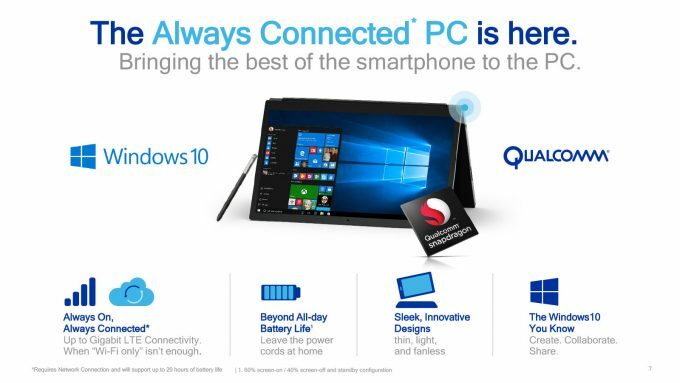 Qualcomm has been dropping hints about a partnership with Microsoft for months now, complete with legal threats from Intel about the possibility of encroaching on x86 patents, but we’re finally here, and the very first Snapdragon powered Windows 10 notebooks were shown off by ASUS and HP at the Hawaii Tech Summit. First of all, this isn’t Windows RT 2.0 as was the botched launch of Windows 8, this is actually Windows 10 in full force, complete with x86 support across the board. So how is it running on ARM architecture? At the moment, we’re still asking around for specifics, but we do have some initial details. Microsoft is doing most of the work on the software side of things. Windows already had some initial work done on the core kernel back with Windows 8 when it created Windows RT, it’s a case of bringing that up to date for Windows 10. 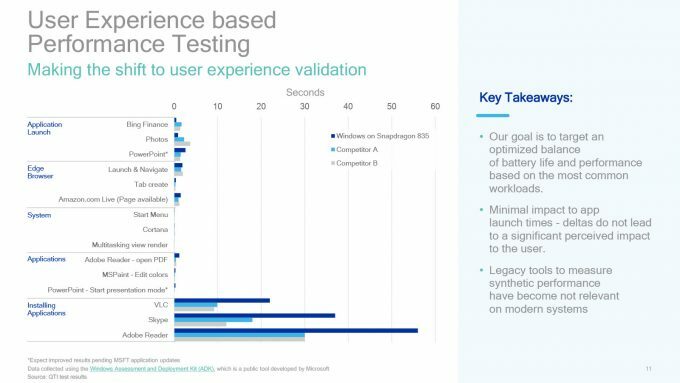 On top of this, Microsoft has been slowly changing the way the OS handles libraries because of the new Universal Windows Platform (UWP) packaging system. UWP is what will allow native Windows applications to install on any Microsoft device, including software to work on Xbox One, Xbox games to run on Windows 10, and Windows Mobile apps to run on any device. These applications are built around a unified platform, so it comes down to the OS kernel to handle the specifics, which is how Microsoft will push these Snapdragon powered devices. However, what about native x86 apps? If Microsoft launched these devices with only UWP apps supported, we’d have Windows RT all over again, and would likely die the same death as before. This time though, there is x86 support built into the OS, with Microsoft providing the library for the emulation, and this is then abstracted to native code on the CPU. This does mean software emulation and a performance impact will likely be noticeable, but UWP apps will run at full speed (once some optimization has been performed). So a Windows 10 notebook, running on an ARM CPU, using professional applications like Photoshop, is soon to be a reality, albeit with a performance hit for native x86 applications – but it’s a starting point, and a very important first step. However, one question that might be going through your head will be “Well, what benefit does using something like a Snapdragon 835 SoC bring to a Windows computer, or notebooks in general?” – and much of the presentation was centered around this very issue. What Does Bringing ARM To Windows Allow? Does anyone remember the Intel Atom-based x86 phones? A few of you will, but for the most part, it was a rather costly experiment for Intel, as it never really took off. The x86 instruction set is diverse and well supported, with decades of applications built around it, and is critical for enterprise compute, desktops, cloud storage and such, but if there is one thing it lacks, it’s power efficiency. Intel has made great strides in bringing the power target down on its CPUs, with smaller manufacture processes, faster sleep states, and architecture improvements to lower power consumption. But even the most power efficient x86 CPUs will draw 2-3x the amount of power as an ARM CPU, and when it comes to always connected, always online devices, battery life is the number one concern. The very best, low-powered x86 notebooks and laptops, can just about squeeze 8-10 hours of realistic use time out of a device, which is good enough for a day of light work. For more aggressive uses, you can typically get about 4 hours. Battery life in laptops has always been a struggle, and has been very high on the list of demands. So when a notebook comes along that can do 20 hours of work, with a month of standby time, people take notice, and it’s this that ARM CPUs allow. ARM in smartphones is one of the reasons why we even have smartphones in the first place, the ultra low power and long life means that people don’t need to worry about plugging into a wall every 4 hours. It’s the reason Chromebooks became so prevalent, with their 12-16 hours of battery life. Try as we might, we just can’t get that kind of battery life with x86. As mentioned before, Microsoft tried to bring out an ARM-based notebook running Windows before, with the original Surface and Surface 2 running Windows RT, an offshoot of Windows 8. The hardware was fine and capable, with decent battery life and standby times, but was ultimately doomed because Windows RT was not Windows, but a highly restrictive, cut back version that was entirely dependent on its own app store. No x86 support and no custom applications basically killed the device on launch (there was never even an official Spotify app for the thing). This time around, Microsoft wants the best of both worlds. The rich application support of x86, with the power efficiency of ARM. Qualcomm’s Snapdragon 835 is already at the heart of nearly all flagship smartphones, and is an extremely capably chip, so it was a pretty easy decision for Microsoft to pick that as the building block for a new wave of notebooks. It’s worth bearing in mind though, smartphones are not notebooks, and they are no replacement for a desktop either, so x86 will remain prevalent, simply because of ubiquity and high performance. Intel and AMD are not likely to lose much ground in the laptop and notebook markets with this launch, as these ARM notebooks are more likely to eat away at the tablet market than x86 notebooks. Plus, I don’t see Doom running on one of these notebooks any time soon (although that would be highly entertaining). So What Are These New Notebooks? ASUS and HP were at the event to showcase the very first generation of these Snapdragon powered Windows 10 notebooks. ASUS’ NovaGo was the only one to list prices at launch. 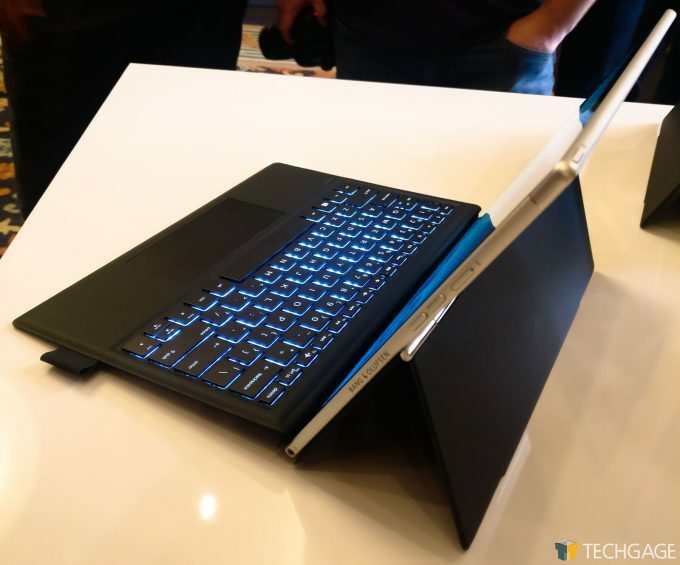 Both the NovaGo and HP’s ENVY 2 had similar specifications, with one main difference being the HP ENVY 2 was just 6.9mm thick on a 12.2-inch display, compared to 14.9mm thick on the NovaGo with a 13-inch display. Starting specs for the two are Qualcomm’s Snapdragon 835 SoC handling the processing, with an X16 4G LTE modem (X50 5G modems are to come later), and will come with 4GB or 8GB of RAM, and either 64GB or 256GB of storage, the faster UFS type, rather than eMMC. ASUS had the lower spec’d device starting at $599, and the higher end version set for $799, which are surprisingly comparable to equally spec’d flagship smartphones using similar hardware. Now, alarm bells will likely ring for some of you when I say that the OS included will be Windows 10 S, the ‘cut back’ version of Windows 10, one that spawns images and horrors of the now defunct Windows RT. When Microsoft announced Windows 10 S, there was similar speculation, but the main difference here is that anyone with a 10 S OS can upgrade to a full version of Windows 10, and it’s the same here with the NovaGo and ENVY 2. 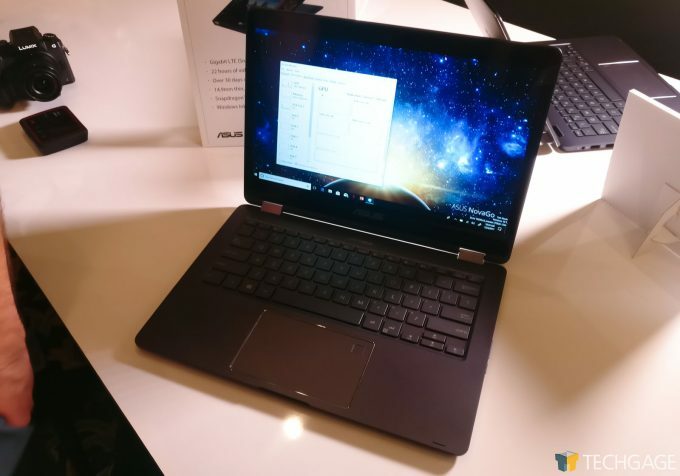 There may be an extra cost (which is likely why these devices are cheaper than expected), but ASUS is offering a free upgrade to 10 Pro for those that purchase these devices before September 30th 2018 ( should note, these notebooks are not available just yet, but soon). 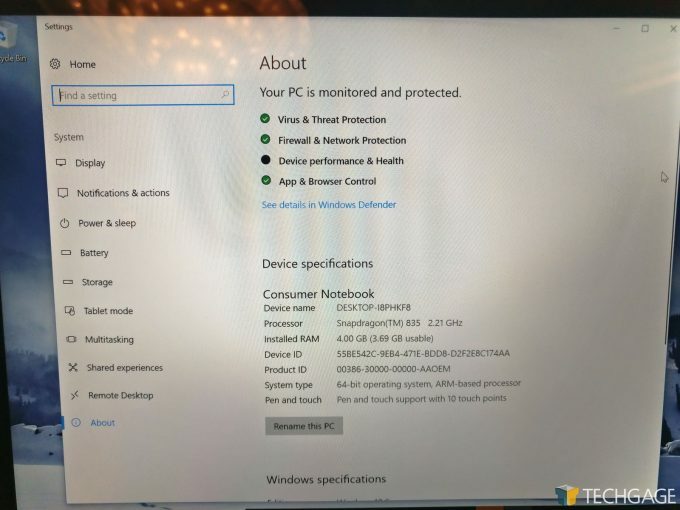 We did manage to sneak some shots of Windows 10 actually running on these devices, with the proof and all that being the reported system specs and an interesting view of taskmanager. 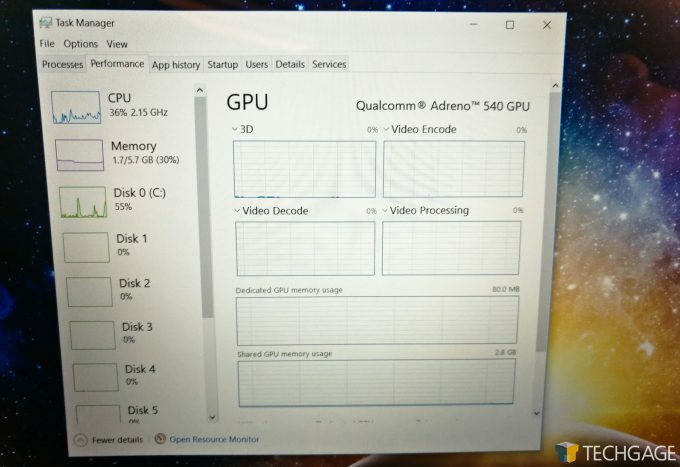 The GPU reported on the ASUS NovaGo was a Qualcomm Adreno 540, and taskmanager broke down the GPU into four components, including 3D use, Video Encode, Video Decode, and Video Processing. The CPU was operating at 2.21GHz as well. 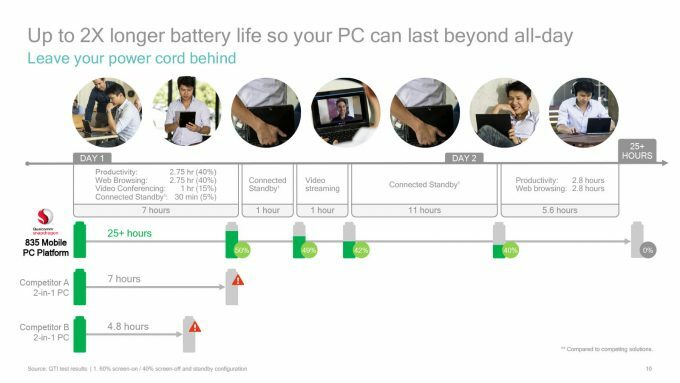 Both HP and ASUS listed very similar battery life, and basically, the whole point of these systems. The key numbers were over 20 hours of productivity, and about 30 days of standby time. In both cases, productivity was measured as video playback for a solid 20 hours. Why is that important? Video playback actually doesn’t use the CPU much, as it’s mostly offloaded to dedicated decoding hardware in the GPU. With that, we do expect real productivity to be lower, but hard to estimate an exact time. 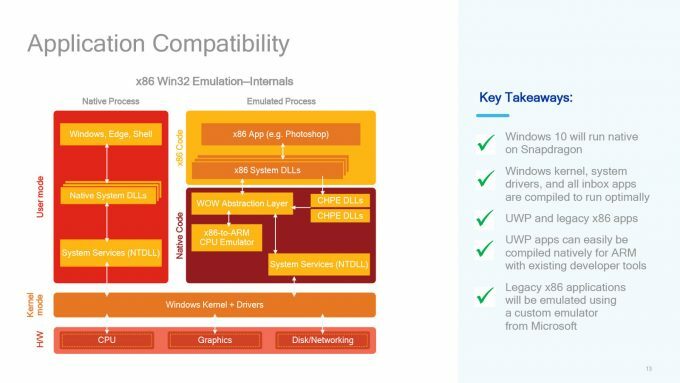 This is further complicated since we don’t know the impact of x86 emulation vs native UWP applications. Based on one of the slides in the press deck, we see a mixed workload of applications and web browsing taking 50% of the battery over 7 hours, so we can guess about 14 hours of real productivity to be expected (instead of just watching videos). This puts it more in line with a realistic battery life, and in fact, makes it comparable to something like a Chromebook. Getting two full work days of battery life out of these notebooks seems quite reasonable, but this likely assumes native application support, so Office 365 for productivity, and Edge as the web browser. We’ll have to see how Chrome, Firefox, and Libre Office will behave, and of course, what kind of performance can we expect from something like Photoshop (which will prove to be extremely interesting). What seemed a little out-of-place from the event was a quick drive-by announcement from AMD. What is an x86 CPU provider doing at an event like this, where the real showcase was a direct competitor to its own products? Well, AMD has its own APUs, these are fusions of AMDs CPUs and GPUs into a single package, and almost direct competitors to Qualcomm’s Snapdragon SoC. AMD was announcing a partnership with Qualcomm to include 4G LTE modems into its own notebooks and laptops as part of a reference design package. Effectively, this means AMD wants some of that ‘always connected’ action in its own laptops, instead of relying on just WiFi access that has been prevalent in most notebooks. The inclusion of a modem means users won’t have to tether their phones to the PC to get Internet access. A minor announcement, but an important one nonetheless. What else can we expect from Qualcomm? There is still more to come from Qualcomm, that ties in with other announcements from partners including Samsung and Xiaomi. The most obvious being the successor to Qualcomm’s flagship SoC, the Snapdragon 845. No, we don’t have any details beyond a generation name, but details will be coming later tomorrow. US mobile carrier Sprint, was also at the event to hype up about the implications of 5G and how it plans to support the standard with Qualcomm, and Xiaomi showing how quickly the company has grown with the help of Qualcomm. Tomorrow will be when some of the architecture stuff is announced.